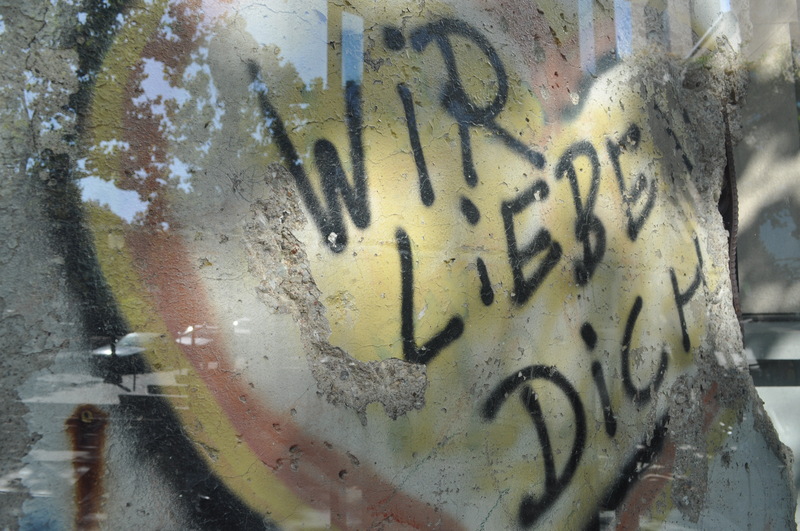 I came across this segment of the Berlin Wall while walking up the steps of my local library. At first glance, I thought it was – as I said earlier – a slab of concrete, messily covered with graffiti. But then I saw the words, surprisingly legible and amazingly, words that belonged to my elementary German word bank. How did I stumble across this relic while returning the book I hadn’t even finished? How did it manage to travel halfway across the world and land in my own backyard? To me, this was an astonishing discovery, and I found it to be even more heartwarming and meaningful as I thought about it that evening. For those who know me, I have a strong affinity for Berlin; as my first study abroad location and pure “outside of my comfort zone” experience, Berlin is a treasure collection of hundreds of exciting, funny, and eye-opening memories. Thus, this art piece is my personal story of my own time spent in Germany. But even more significantly, I am certain that this wall is the story of the ignored, powerless, and provoked people of Berlin, divided by a wall that fractured families, friends, and loved ones for 30 years. Perhaps the sentence “ We love you” was a quick admiration of love from two best friends split apart, or, as I like to think, a collective message from West Berlin to its brother in the East (or vice versa), enforcing the fact that those on one side of the wall would never forget those on the other. Nevertheless, this photograph is a composite of countless unexplained stories. While for me, it brings to mind fond memories of travel, to others, it can easily be a symbol provoking sadness, hate, or regression. Aaron: I like this more given your statement – it makes me wonder about the stories behind all of the graffiti we see around us everyday. It’s so visually loud and attention seeking, but ultimately silent unless you know how to read it and understand the meaning in its own context. Fernando: You have a great picture here! It’s strong, it’s full of meaning, it holds historical significance, like you said in your statement. However, I feel like you might have oversimplified the story (or a story). I would have liked to have seen what goes along with the words Wir Liebe Dich: maybe a couple in love, or a family separated by the wall, or even a blatantly acted out representation of one of those. Overall, it’s a great shot! Good work! Jessica: I loved reading your artist’s statement. The photo itself is also fantastic- I love how the texture of the crumbling concrete, peeling paint, and reflection of the glass play together in this image. Even without an understanding of the words, the image can still invoke a strong feeling of sadness. Mary: I really like this choice to show a story in one photo. It’s a challenge. Even without knowing that this was a portion of the Berlin Wall, I still find it incredibly meaningful. I think the fact that it says “we love you” rather than “i love you,” gives some pause. Who are they? Who is the “you”? It’s (probably) not a declaration of romantic love, not to say that the story behind a declaration of romantic love is uninteresting, but it IS more common. This is the story of a broken relationship, and the attempt to heal it. And the fact that this declaration was made in a public space speaks to the greatness of the separation and the hurt. It says a lot in just one picture. Well done! Posted in #3 - Someone Else's Story, JacquelynTagged berlin wall, collaborative, community, digital photography, german, jacquelyn, photographer, photography, tell someone else's story, the photograph collecitve, we love you, wir liebe dichBookmark the permalink.